Each of these topics is addressed in the following sections of this documentation. Undoes any changes you might have made to the Look and returns the Look to its original state. For example, suppose you add a new filter and then, for good measure, change the row limit in the Data Section. Clicking Reset Look removes the filter modification and restores the original row limit. Note that this affects only the data set and the data display of the Look. If you apply a schedule to the Look or if you enable/disable autorun, those changes cannot be undone by clicking Reset Look. Opens up an Explore that uses the exact same settings as the Look. Note that this Explore replicates the Look but is not tied to the Look in any way: if you make changes to the Explore those changes will not affect the Look. Type the new description in the Description field and then click Save. 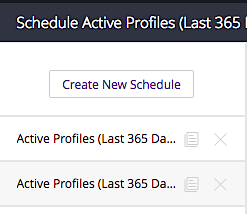 The Scheduled section has two primary functions: 1) it lets you know whether you (or anyone else) has applied a schedule to the Look; and, 2) it lets you create or delete schedules (albeit only your own schedules) for that Look. Note. But just for that Look: schedules must be created one Look at a time. The message No means that no one in your organization has applied a schedule to this Look. The message Yes, only by you means that you’ve added a scheduled to the Look, but no one else has. And the message Yes, by you and one other person (or two other persons or nine other persons or whatever) means that you and someone else have scheduled the Look. (There could be other status messages applied, but you get the idea.) Knowing whether or not other people have scheduled the Look can be useful if you’re thinking about deleting or moving the Look. Has anyone else applied a schedule to the Look? Has anyone else applied a schedule to any Look? That information is not available to you. Note. Why would you even want to apply multiple schedules to a Look? Well, for one thing, you might want delivery at different times; for example, maybe you want delivery at 8:00 AM on Mondays but at 4:00 PM on Wednesdays. The dialog box doesn’t allow for that kind of scheduling. For another, your Look might have filters that enable you to return different datasets; for example, you might be able to return data for US residents and then, by adjusting the filter, return data for non-US residents. In a case like that, you could schedule delivery using the US residents filter, then schedule a second delivery, this one using the non-US filter. At that point, click Save All, and you’ll be back to a single schedule. If you delete all the schedules and then click Save All, you’ll no longer have any schedules applied to the Look. You can add the Look to a Dashboard. 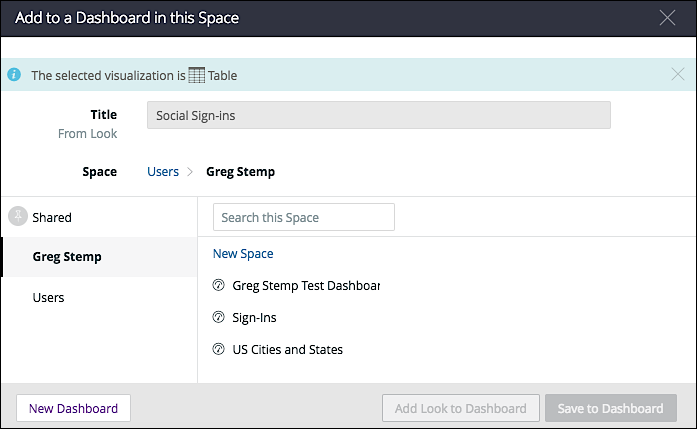 When you add a Look to a Dashboard, you create a link between the Dashboard and the Look. For example, if you modify the Look, the “Look-linked” tile in the Dashboard updates as well. If you delete the Look, or move it to a different space, the Dashboard displays an error (because the original Look is no longer available). The Add Look to Dashboard option is best-suited for Looks you expect to use on multiple Dashboards; that way, if you need to make changes to the Look, you can do so by modifying the Look itself, without having to make those same modifications on each Dashboard. This option is only available for Dashboards in the same space as the Look. You can save the Look to a Dashboard. 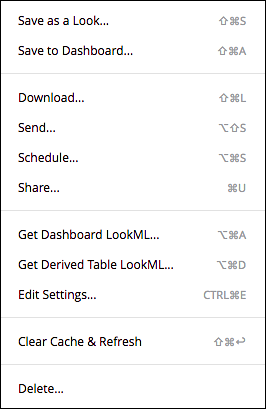 When you save a Look, you essentially install a stand-alone copy of that Look in the Dashboard. 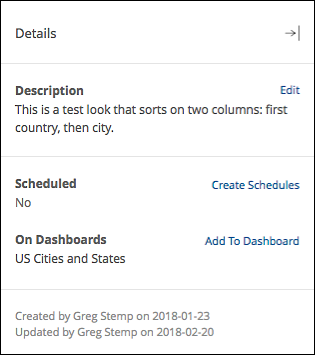 This copy is not tied to the original Look in any way: if you delete the original Look, the copy (referred to in Dashboard as a “query tile”) will continue to work as expected. The title you give your look must be unique within the Space where it is being saved; however, that title does not have to be unique across Customer Insights; you could have a Look called Demographics in every Space in your organization. (However, giving Looks unique names might be something of a best practice.) Title, by the way are case-insensitive: Demographics is the same title as demographics and the same title as DEMOGRAPHICS. Enables you to save the Look to a Dashboard. When you do this, the Look is saved as a tile and not as a look; that’s important to keep in mind, because tiles are bound to a Dashboard. 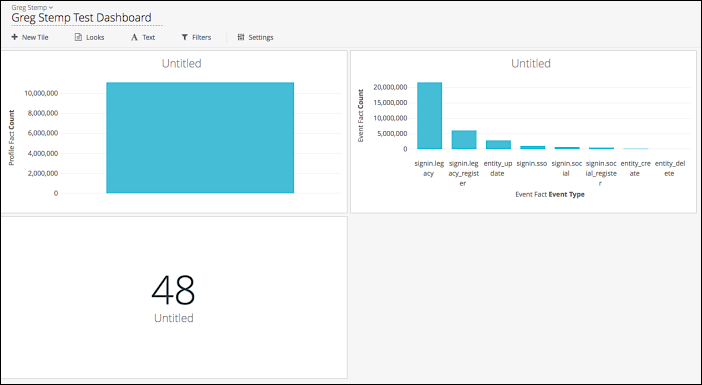 By contrast, Looks can be added to multiple Dashboards, and can be viewed even if they are not part of a Dashboard. Enables you to download a copy of the Look data to your computer. See Downloading Data for more information. 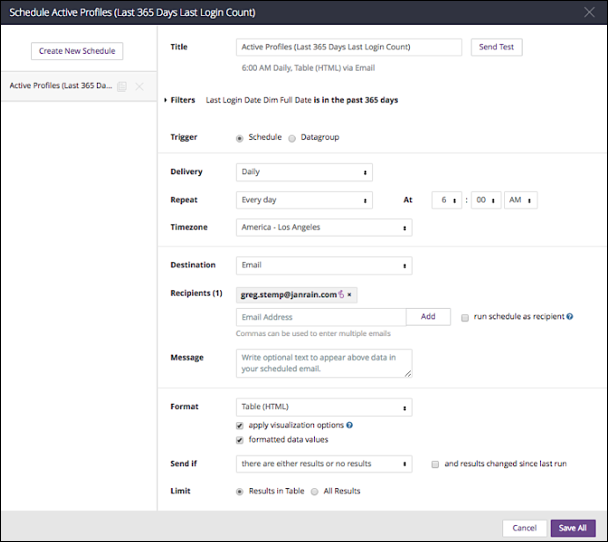 Enables you to send a copy of the Look data to someone else, even if that person does not have access to Customer Insights. See Sending Data for more information. Enables you to schedule automated retrieval and delivery of Look data. See Scheduling Data Delivery for more information. Note that this URL does you no good unless you have a valid Customer Insights account and have access to the Space where the Look is stored. In turn, you must click Run in order to retrieve data and display the visualization. Note that this only applies to the Look itself. If you add the Look to a Dashboard (and if the Dashboard is set to autorun) this setting will be ignored and the query will run each time the Dashboard is opened. 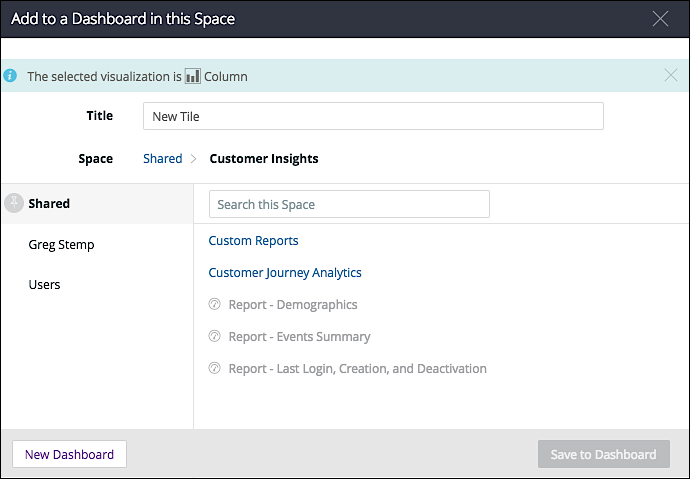 When you first access a Look, Customer Insights retrieves the requested data from the data warehouse. That data is then displayed in your visualization, and a copy of the data is stored in the cache, where it remains for one hour before being discarded. If you (or anyone else) accesses the Look during that hour, data will be retrieved from the cache rather than the data warehouse. That means that the data displayed on the Look might not be the absolutely latest set of data stored in the data warehouse. Permanently remove the deleted items from Customer Insights. Do nothing at all (deleted items can remain the Trash indefinitely.